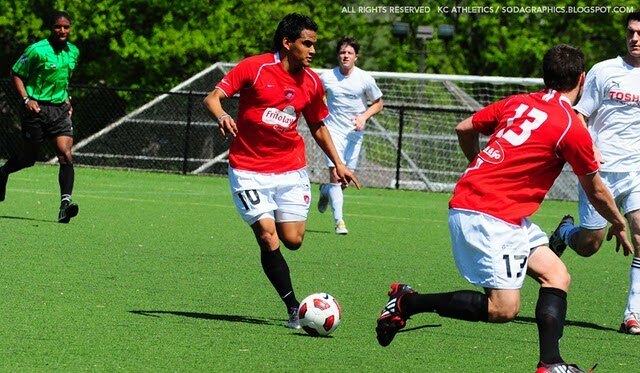 Bryan Perez scored a brace for the Menace yesterday. The Kansas City Athletics found themselves behind from the start as they started their attempt to qualify for their second straight US Open Cup in a qualifier against the Iowa Menace. The Athletics only had 10 men on the field from the start against the Menace. Talking with some Kyle Perkins of the Athletics after the game I found that a lot of factors went into them playing with only 10 players. A few guys were out of town, a few were called into the office, some where called down to the Southeast for their job working with the clean up after the tornadoes, and two players signed pro contracts since rosters were due to the USSF. Saying all that though takes away from the strong game that their opponents, the Menace player today at Rockhurst University. From the start, the Menace were the more dominate side, trying to capitalize on the numerical advantage that they had over KC. While KC started the game with only 10 players, the Menace traveled 17 for the game today. Early in the game though, the Athletics were able to weather the Menace with some good defense and a well worked offside trap as the Menace were called offside numerous times in the first half. The Menace did create good chances though, the best chance early on fell to John Sosa for the Menace as he was played in behind the defense beating the offside trap. Sosa's chip though was just wide of the net. The lack of finishing by the Menace came back to bite them in the 31st. The Athletics had been working themselves back into the game, having weathered the early attack by the Menace. Marty Johnston collected the ball of the right side, his first cross was cleared, but not far enough, and Johnston had another chance. Johnston squared the ball into the middle where Kyle Perkins slide in, knocking the ball into the net giving the Athletics the 1-0 lead. The Menace almost had the equalizer in the 39th, when Sosa was played behind the defense again, but Bret Clark in goal for KC got enough on the shot to slow it down that Josh White recovered and cleared the chance. In the 42nd minute, KC created a good chance through Johnston again that the Menace cleared for a corner. The corner came to nothing, but the Menace sprung the counter through Sosa. Sosa played Bryan Perez in behind the KC defense. Perez's first shot was saved by Clark in goal, but Perez followed and was able to slot home tying the game in the 43rd. The goal started a late flurry for the Menace as KC seemed to tire a bit. The Menace pressed for a second goal and got another just before stoppage time. Perez played a give and go with Sosa and Alvarez slotted the ball to the far post giving the Menace a lead that they wouldn't surrender. Things got worse for the Athletics as the Menace continued to push. The Menace earned a corner and with the last touch of the first half, the Menace made it 3-1. The Menace earned a corner and on the corner that followed Sosa played a ball into the box where Brady Blankenship had beaten his man and headed easily into the net to give the Menace a big half time lead. The Menace extended the later flurry into the second half as the Athletics seemed to tire just a bit. Former PDL MVP, Tomas Boltnar, a half time sub set up the Menace's first goal of the half, playing Sosa through, who chipped Clark from the top of the box to give him a goal to add to his two assists in the first half in the 58th minute. Shortly after Sosa's goal, the Athletics almost got back into the game, as Geoff Miles, fired in a free kick from the side of the box that almost caught Menace keeper, Matt Wade napping. Wade palmed the ball away keeping it 4-1. Virtually on the Menace's next attack they made it 5-1. Right back, Ben Taylor played a cross into the middle or second half substitute, Jarrett Hamilton, who just had to tap the ball home. In the 67th, Hamilton got his second of the game as Perez broke down the right again. Perez's initial cross was nearly cut out by Ben Hicks for the Athletics, but his clearance deflected off of Hamilton and into the net making it 6-1. Iowa seemed to take their foot off the gas a little bit, and at times got a little to fancy in trying to find a seventh goal. Perez got in behind the defense twice, but both times was too unselfish as he squared the ball back, once missing his man and once playing the ball to an offside Hamilton. Iowa also had a penalty shout in the 70th minute, when Sosa appeared to be sandwiched by two Menace defenders, but no call was made. KC was still trying to make a game of it, and in the 85th, they almost got a second. Josh White, normally a defender was playing up top trying to give a break to Perkins, who for long periods was totally isolated up top for KC. White got played in behind the Menace defense and got around Wade in the Menace goal, but Wade had done went to push White wide and his shot was wide of the near post. In the 89th minute, the Menace got their 7th goal, and the one that would automatically qualify them for the Open Cup. Substitute, Austin Otto played a great cross field ball into the box for Boltzmann, who settled, took a touch and then played the ball back to Sosa who fired the ball into the far post to make it 7-1. KC Athletics – Bret Clark, Ben Hicks, Ryan Barber, Josh White, Mike Robards, Marty Johnston, Stephen Homan, Geoff Miles, Kyle Perkins. Iowa Menace – Matt Wade, Anthony Colaizzi, Thomas Catania, Diego Marroquin, Ben Taylor (Austin Otto 75), Luis Piffer, Chris Van Leur (Tomas Boltnar 45), Brady Blankenship (Graham Nugent 67), Aaron Douthitt (Jarrett Hamilton 53), Bryan Perez, John Sosa. This week's From the Byline to the Back Post is now up for your listening pleasure on Posterous and iTunes. This week Thad and I discuss the New England game, the upcoming New York game, Collin's suspension being rescinded (this was recorded before Diop's suspension was handed down), and the ever wonderful topic of promotion and relegation. Thanks again to The Vandon Arms for the music to open the podcast that seems to perfectly match plenty of fans moods about the team right now. Not only does Sporting KC have a game day today, but so does the KC Athletics. Today at Rockhurst University the Athletics host the Iowa Menace at 2pm. The Iowa Menace used to go by the Des Moines Menace Reserves, and have a roster that includes former PDL MVP, Tomas Boltnar. On the other side, the Athletics roster features 3 former SKC Wizards on the team, Ryan Barber, Brian Roberts, and Ryan Raybould. The team also features three other players that have trained with KC, Geoff Miles, Josh Howard, and Josh White. It should be a fun game to watch so get out to Rockhurst at 2pm to catch it. I will also be providing updates on the game via Twitter. Post game, the Athletics are hosting a post game party/Sporting KC watch party at Llewellyn's Pub in Overland Park just east of Metcalf on 151st Street. Good luck to the Athletics today. Tomorrow in New York, Sporting Kansas City begins the second half of their 10 game road trip against the New York Red Bulls. New York comes into the game tomorrow on the backs of two blow out wins against San Jose (3-0) and DC (4-0). Thierry Henry has started to get into good goal scoring form, getting 3 goals in the last two games. Luke Rodgers has become the current partner for Henry, with Juan Agudelo, the latest US soccer teen sensation coming off the bench. That's not even including the likes of Dane Richards and Joel Lindpere on the wings who can score plenty on their own. New York is going to be the biggest offensive threat that KC's weak defense has faced all season. KC will have Aurelien Collin available after his suspension was rescinded, but that comes that the expense of Birahim Diop. Most fans are not too disappointed in that. One thing that this move will cause I think is that it will give us a Collin and Julio Cesar partnership, which honestly I dread seeing. I'm not a fan of Cesar's and I struggle to find many people that are fans of his. He just doesn't play the style defensively that is needed with the type of lineup that KC plays. As for who replaces Diop, I think we'll see Stephane Auvray step back into the starting lineup. I hope this move was coming anyways, but that remains to be seen. Other than that I'm not sure if we'll see any changes, but I wouldn't mind seeing more in the midfield as the team has struggled in all five games so far to control the midfield. Milos Stojcev, Davy Arnaud, and whoever has played d-mid have not looked good. We'll see if Peter Vermes feels the same way or not. Number to Remember - 4 - Number of games that KC has gone without a win since defeating Chivas USA in their first game 3-2. Key Match Up - Aurelien Collin vs Thierry Henry - The Frenchman vs the Frenchman, Henry is on a nice run of form right now and is leading the Red Bulls attack. Collin is going to have to play a lot smarter than he did against New York though, Henry isn't the type of forward that he went up against in New England. More of a finesse player. PREDICTION - I have very little confidence in this game, New York is playing extremely well, and well, KC isn't. The defense is still struggling greatly, and the thought of a Collin/Cesar partnership in the middle of defense worries me a lot. More so for the later player in that lineup. This part of the road trip is the tougher half of the two and it starts with the hottest team in the league probably. Of course in recent years under Vermes, Wizards teams seem to step up when they play the elite teams in many instances. So maybe the team will come out and surprise us. But I'm not holding my breath. Earlier this week when MLS rescinded Aurelien Collin's red card, they stated that there would be no punishment for Birahim Diop on the play. That changed today when MLS announced that the red card suspension for Collin had been transferred to Diop. Diop will now miss tomorrow's game against New York. In regards to MLS changing their mind, the league and US Soccer's hands were tied. According to the release from the league, "Because the misconduct was assessed and included in the match report, and the only reason Diop was not sanctioned initially was because of mistaken identity, the FIFA Disciplinary Code requires that Diop be issued the red card and serve the corresponding one-match suspension. Per the corrected interpretation, the MLS Disciplinary Committee did not have jurisdiction to decide whether or not Diop would be suspended." The league's hands were tied by the FIFA Disciplinary Code. Still doesn't explain why, if the league knew of this, this wasn't announced originally when Collin's suspension was rescinded. Just another example that there needs to be some sort of review after games and some way to totally rescind cards or hand out cards retroactively, like to the instigator and diver in the incident, Benny Feilhaber. During "Off the Pitch" Sunday night in the closing of the program, Callum Williams made mention that the game was Sasha Victorine's last game in the booth for a while. Today we got more of an explanation as to what is happening. Victorine is gone from the booth and will take another position in the organization. Based on a post by Williams on Bigsoccer, it sounds like it had plenty to do with family and Victorine wants to spend time with his kid. The team has not announced a permanent replacement, but for this week in New York, Williams will be joined by Brian Kilmeade of "Fox and Friends". Kilmeade is a former college player, and was a sideline reporter for New York when they were the Metrostars. His work on Fox though has overshadowed this announcement in some fans eyes who look at his political views and are not really happy with some of the comments that Kilmeade has made in the past. Personally I don't really care, I'm not watching the game for his political views, and honestly I likely won't hear many of his comments. Jimmy Conrad - Chivas USA - Did not dress in Chivas 2-1 win over San Jose. Adam Cristman - LA - Did not dress in LA's 3-0 win over Portland. Luis Gil - Salt Lake - Did not dress in RSL's CCL game against Monterrey. Taylor Graham - Seattle - Did not dress in Seattle's 1-0 win over Colorado. Kevin Hartman - Dallas - Started and played 90 minutes in Dallas' 2-1 win over Vancouver. Frankie Hejduk - LA - Dressed but did not play in LA's 3-0 win over Portland. Will Hesmer - Columbus - Started and played 90 minutes in Columbus' 1-1 draw with Toronto. Jack Jewsbury - Portland - Started and played 90 minutes in Portland's 3-0 loss to LA. Rauwshan McKenzie - Salt Lake - Did not dress in RSL's CCL game against Monterrey. Kurt Morsink - DC - Did not dress in DC's 4-0 loss to New York. Started and played 90 minutes in DC's 3-2 loss to New England in the US Open Cup. Ryan Pore - Portland - Dressed but did not play in Portland's 3-0 loss to LA. Scott Sealy - San Jose - Started and played 64 minutes in San Jose's 2-1 loss to Chivas. Khari Stephenson - San Jose - Started and played 55 minutes in San Jose's 2-1 loss to Chivas. Tyson Wahl - Seattle - Started and played 90 minutes in Seattle's 1-0 win over Colorado. Josh Wolff - DC - Started and played 90 minutes in DC's 4-0 loss to New York. Did not dress in DC's 3-2 loss to New England in the US Open Cup. Kevin Friedland - Minnesota - Did not play in Minnesota's 3-1 loss to Puerto Rico. Aaron Hohlbein - Fort Lauderdale - Started and played 90 minutes in the Strikers 2-1 win over Atlanta. Amir Lowery - Montreal - Started and played 75 minutes in Montreal's 0-0 draw with Tampa Bay. Started and played 75 minutes in Montreal's 1-0 loss to Vancouver in the Nutrilite Canadian Championship. Abe Thompson - Fort Lauderdale - Did not play in Ft. Lauderdale's 2-1 win over Atlanta. Stephen Armstrong - Charleston - Did not play in 2-1 loss to Richmond. Edson Elcock - Richmond - Started and played 87 minutes in Richmond's 2-1 win over Charleston. Neal Kitson - Rochester - Started and played 90 minutes in Rochester's 3-2 win over Dayton. Yomby William - Richmond - Started and played 90 minutes in Richmond's 2-1 win over Charleston. John Wilson - Charleston - Started and played 90 minutes in 2-1 loss to Richmond. Sunil Chhetri - Chirag United - India - Tied Mumbai FC 0-0. Eloy Colombano - Ferrocarril Sud - Argentina - Season is over. Pablo Escobar - Deportivo Cali - Colombia - Started and played 90 minutes in Cali's 3-2 win over Envigado. Tied America De Cali 0-0 in the Copa Colombia. Herculez Gomez - Pachuca - Mexico - Started and played 90 minutes, scoring a goal in Pachuca's 1-1 draw with Queretaro. Zoltan Hercegfalvi - Budapest Honvéd - Hungary - Did not play in either of Honved's two games this week. Will John - Vinogradar - Croatia - lost 2-1 to Croatia Slavonski Brod. Eddie Johnson - Fulham/Preston - England - Started and played 90 minutes in Preston's 4-0 loss to Millwall. Did not dress in Preston's 1-0 loss to Cardiff. Carlos Marinelli - Universidad San Martin - Peru - Did not dress in San Martin's 2-2 draw with Melgar. Yura Movsisyan - FC Krasnodar - Russia - Did not dress in Krasnodar's 4-1 loss to Lokomotiv Moscow. Matt Taylor - Rot Weiss Ahlen - Germany - Started and played 90 minutes, scoring a goal in Ahlen's 5-1 loss to Stuttgart II. Sporting Kansas City announced today the date of their final US Open Cup qualifier against New England. The Wizards will play the Revolution on May 25th, at a location still to be determined. For KC the game comes between trips to Seattle and Colorado. For New England the game is between a trip to San Jose and a home game against the Galaxy. So both teams will have a bit of travel before the game. The location for the game has not been announced, it had been assumed the game would be at either UMKC or Blue Valley, but tonight on Twitter Robb Heineman may have thrown out a big hint on the location of the game. Heineman posted "can you say swope open cup? No turf for the Revs." So are we going to see the Wizards play the Revs at the Swope Park training complex? I certainly hope that we don't. I think the Swope complex is a fantastic training center, but that's just it, it's a training center. For a real game, that doesn't exactly say professional to me. If they don't want to do turf, it also means a much earlier start time to the game to make sure it gets in, as there are no lights on the other fields out at the complex. MLS' disciplinary committee today announced that Aurelien Collin will not be suspended for this weekend's game against New York. Collin was given a red card for "striking an opponent" aka shoving Benny Feilhaber. The league announced that after reviewing the play it was a case of mistaken identity as Birahim Diop was the one that shoved Feilhaber. MLS' said "US Soccer reviewed the red card issued to A. Collin and determined that the incident was a case of mistaken identity with B. Diop. As a result A. Collin will no longer be suspended for the next league match. The MLS Disciplinary Committee reviewed the play and ruled that no sanctions against B. Diop were warranted. Therefore, both B. Diop and A. Collin are eligible to play in their next match against New York Red Bull." So basically what the league said is that the play was not a red card at all as they did not hand out any suspension to Diop as he was the one that shoved Feilhaber on the play. This is certainly good news for KC as in the 75 minutes he did play Collin looked much more competent in the center of defense than Julio Cesar or Shavar Thomas, who have partnered Matt Besler so far this season. In more US Open Cup news, KC knows their opponent for their next US Open Cup Qualifying match. The Wizards will take on the New England Revolution after the Revs held on to a 3-2 lead tonight in Maryland against DC United. The official date of the game has not been announced, although it looks like it could be May 11th. That would be the Wednesday right after the team's off week on May 7th. It's also right before a trip out to LA for KC. For the Revolution the game would be between two home against against the Colorado Rapids and Vancouver Whitecaps. The location has not been announced yet either, but seems likely it'll be either on UMKC's campus or at Blue Valley Athletic Complex. The game will be a quick turn around chance for Sporting KC to erase the memory of last weekend's game against the Revolution. The location for the KC Athletics US Open Cup qualifier has changed. The game will not be at the Swope Park training complex. Instead, the game is set to take place at Rockhurst University. The game time has not changed, the Athletics will still play at 2pm against the Iowa Menace. For reference, the field at Rockhurst University is a turf field. Get out there and support local soccer as the Athletics attempt to qualify for the US Open Cup. Sporting Kansas City isn't the only team that will be playing on this Saturday, the KC Athletics begin their attempt to qualify for their second straight US Open Cup when they take on the Iowa Menace at the Sporting Club Training Complex at Swope Park. The timing of the game is perfect in relation to Sporting KC's game that night in New York. The Athletics game kicks off at 2pm out at Swope, plenty of time for the game to finish up and for fans to get downtown to Johnny's in time for the 6:30 kickoff for Sporting KC. These two teams met last year up in Iowa with the result finishing 3-3 and the Athletics going through on penalty kicks. As a quick refresher, there are 3 matches in Region II. The winner by the largest goal difference qualifies for the Open Cup directly. The other two winners face off for Region II's other spot in the tournament. Here are the stats from yesterday's game. Aurelien Collin was the 150th player to appear in a competitive game for Sporting KC. Collin picked up the third red card of the season for KC, they picked up 4 in all of last season. Kei Kamara's first goal tonight broken his tie with Igor Simutenkov, Miklos Molnar, and Chris Henderson for 17th on that list. Kamara is now tied for 12th on that list with 14 with Jack Jewsbury, passing Matt McKeon, Jose Burciaga Jr, Sasha Victorine, and Claudio Lopez in the process. Karama's second goal was also his 14th goal in all competitions, moving him into 20th place on that list passing Chris Henderson. In th the 5th minute, Davy Arnaud moved past Jimmy Conrad and into 3rd place for league minutes played, he finished the game with 18,280 minutes played. In the 73rd minute, Michael Harrington moved past Uche Okafor and into 13th place for the most league minutes played. He finished the game with 9,531 minutes played. Harrington also made his 117th start in all competitions for KC, breaking his tie with Okafor for 14th place. Shavar Thomas made his 100th appearance in all competitions for KC. He's the 24th player to hit that mark. Matt Besler made his 50th appearance in all competitions. He is the 45th player to hit that mark. Sporting KC performed better than they did last weekend against Columbus, the offense looked better, but in the end the old defensive problems came back up as KC fell to New England 3-2. A little bit of a surprise heading into the game was that Peter Vermes only made one change from the lineup that looked uninspiring in Columbus. That was insertion of Aurelien Collin in the place of Julio Cesar. From the start KC looked to be playing better, but it was actually New England that grabbed the lead. After Collin pushed wide to cover Rajko Lekic, Lekic crossed the ball into the box. Michael Harrington didn't get enough on his clearance only getting it as far as the debuting Benny Feilhaber. Fielhaber touched the ball back to Marko Perovic. Perovic one timed his shot from about 25 yards past a diving Jimmy Nielsen. Kanasas City responded well though to the goal, as Kei Kamara beat Matt Reis with a shot low to the near post after he turned Didier Domi. KC continued to push to try and find a second goal. Davy Arnaud had the best chance to grab the lead on a quick counter. Harrington raced down the wing and squared a ball into the middle for Arnaud. Arnaud's shot though was knocked away by Reis for a corner. In the second half both sides continued to push the game. KC looked the team that was more likely to score the second goal with some decent build up play but not being able to really test the Revolution keeper. In the 68th minute the game turned a bit when Teal Bunbury was brought down in the box by Kevin Alston. The penalty call was certainly questionable as the ball was out of play before Bunbury was even fouled. But the penalty was called and Kamara stepped up and buried it giving KC the 2-1 lead. But as with New England's first goal when KC responded quickly, New England did the same. A free kick from Kenny Mansally was headed over Nielsen and into the net by Sharlie Joseph in the 72nd to tie the game at 2-2. Joseph beat KC's goalscorer Kamara to the header on that play. Shortly after the tying goal, KC found themselves down a man as Collin was red carded for a shove to Feilhaber. The lead up to the card saw KC with a corner kick. Collin went up to try to head the ball against Revs goalkeeper, Reis. The two collided in air and both hit the ground. Feilhaber took exception to the challenge and got into Collin's face as he got to his feet. In that process Feilhaber was shoved. Referee, Edvin Jurisevic thought it was enough to give the Frenchman a red card. Don't expect to see a highlight of that on MLS' website as the red card challenge is no where to be found in the match highlights unlike other red cards in the league. But it didn't appear that it was actually Collin that shoved the US national team player. KC tried to hold out a man down inserting Shavar Thomas into the center of defense with Besler to try and keep the point, but it ended up being Thomas who was beat on the deciding goal. Zak Boggs played a ball into the box where Lekic had slowed his run, losing Thomas and headed the ball past Nielsen to give the Revs the winner. After the goal KC wasn't really able to mount much of an attack in the final 7 minutes to get themselves back in the game. Even the late insertion of Ryan Smith was unable to give KC an offensive burst to find another equalizer. It'd be easy to blame the referee on this one, but I can't really do that. KC was gifted their second goal on a very iffy penalty call. The red card while worse in the long run was a poor call as well. This comes after I had thought that the referee had actually had a fairly solid first half, he'd been able to control the game while also letting guys play. So it was one questionable call each way for both teams. No, my complaint continues to be our poor work at improving our center of defense in the offseason. Collin may be that answer but really needs to learn more about how to play in the league and what he can get away with as he was already on a yellow when he received the straight red and certainly looked like a good bet to get a second the way he was playing. Unfortunately with the way that Cesar and Thomas have played this season it basically forced Peter Vermes hand into starting the Frenchman. Wizards Man of the Match - Kei Kamara - A brace for the man from Sierra Leone, he's now tied with Bunbury for the team lead in goals with three now. The offense continues to shoot on all cylinders (the Columbus game aside), and the defense continues to bring more questions than answers. Player Ratings - Nielsen 4, Harrington 4, Collin 4, Besler 4, Espinoza 5, Diop 4, Arnaud 5, Stojcev 5, Kamara 6, Bunbury 5, Sapong 5. Subs Zusi 4, Thomas 3, Smith NR. Kansas City continues the long running road trip tomorrow when they take on the New England Revolution. New England has been a second home to KC over the years as they've only lost twice there since 2000. The Revolution will be debuting a new midfielder tomorrow, probably in a starting role, Benny Feilhaber, who joined the Revolution via the allocation process this week. Feilhaber adds a nice attacking option for the Revs in the midfield along with Sharlie Joseph and Pat Phelan, their midfield could have plenty of room to work with the way that KC's midfield has played lately. It'll be a tough task for KC to get all 3 points, but with the way New York has been playing lately, and the rest of the schedule of the road getting a result here is needed. You don't want to go into New York to take on a confident Red Bulls side next week on a two game losing streak, and three game winless streak. KC fans are excited about the likely starting chance Aurelien Collin will get in New England starting next to Matt Besler in the center of defense for KC. With the suspension, and general lack of impression from Julio Cesar, this gives Collin and Besler the chance to hold down the starting center back pairing for the immediate future for KC. Plus who doesn't love a player willing to kill for the fans. The question at this point would seem to be who is going to start at d-mid for KC, does the Birahim Diop experiment continue? Or does Stephane Auvray or Craig Rocastle slot back into the starting lineup? With Feilhaber potentially starting for the Revs, I'd rather see Rocastle in there. Number to remember - 10 - That's the number of wins on the road KC has in New England in KC's history, that's the most wins against any team away from home for KC. Key Match Up - Craig Rocastle/D-mid vs Benny Feilhaber - There seems to be plenty of talk that Feilhaber will start tomorrow for New England which will be an interesting match up for KC's midfield. Feilhaber may not know his teammates that well, but will cause them plenty of problems. PREDICTION - As I said earlier I think that this is an important game to get at least 1, but probably all three points is going to be needed just for confidence sake heading into the next few games. This is around the time last year where the team fell back to earth hard, hopefully the team can avoid that this time, pick up a big result in a place that's been friendly to them in the past. Here is this week's From the Byline to the Back Post. This week Thad and I were joined by KC beat writer for MLSsoccer.com, Andrew Wiebe. In the first segment we talked about the Columbus game, New England game, and the season so far. In part two we spent time talking about former Wizards. In part three that Thad and I recorded last week, we talk about the Firehouse Sub deal and it's relation to building a rivalry and Gooch's article about playing style for KC. Check it out on iTunes and Posterous. Thanks to Andrew for joining us and also thanks to The Vandon Arms again for the music. The sound you hear is the sobbing of some European soccer fans in the US who have grown up watching games from Europe on TV and see promotion and relegation battles as the greatest thing ever. Because today in an interview with the Associated Press Sports Editor, MLS president Mark Abbott said in no uncertain terms that promotion and relegation isn't happen, at least for the foreseeable future. I personally couldn't be happier. While this won't kill the conversations that I have with some fans about the potential for it, it certainly makes the plausibility of those conversations a lot more straight forward. I'd already thought that any talk of pro/rel was pure fantasy and these comments finally confirm my thinking. Things can change in the future, but I share Abbott's view, pro/rel isn't going to happen for the foreseeable future at least for a number of reasons. First while soccer is immensely popular here in the US from youth to the professional level, MLS is not. Now this is where pro/rel supporters will say "that's because the league doesn't have pro/rel." The problem with that line of thinking is that those fans that aren't coming now because of pro/rel are the same fans that were not coming because MLS had the count down clock, or the shootout, or the silly names, etc. The excuses go on and on, if MLS was to institute pro/rel the people that don't come because there's no pro/rel would find another excuse not to come to games. Too many of the soccer fans in this country are either interested in the teams from their country of origin, or are interested in the leagues they see on TV because they're better. And that's certainly true, most of the leagues you see on TV here in the US are better than MLS is currently, but there's something different in being able to go out to the stadium and see live professional soccer. Secondly, the reason why pro/rel isn't going to happen in the foreseeable future is because of the question of "where are the teams going to promote from, relegate to?" And don't say the NASL. The NASL barely got sanctioning to play this season and are losing another one of their teams after this season when Montreal moves up to become the 19th team in MLS. The NASL does not exactly look like a stable league, it looks a lot like other minor league sports leagues in this country that struggle. I will say there is one thing that does bring a resemblance to MLS, and this could be good, or could be bad, and that's the fact that one of the owners, Traffic Sports USA owns three or four of the teams, in a similar situation to MLS after Miami and Tampa folded. Unlike MLS at that time though, the NASL doesn't have the extremely deep pocketed owners like MLS had at the time to carry the league through those lean years. Third, the salary cap, single entity, and all the other things that keep parity in the league are not going away any time soon. In a league with as much parity promotion and relegation could be potentially disastrous. For example a few years ago in back to back years LA and New York would have been relegated. How much would that hurt MLS' bargaining when TV contracts were up and the number 1 and 2 market in the US aren't in the top division? That's certainly going to hurt the league's negotiating tactics in those situations. Finally, pro/rel isn't going to happen in the US because sports here are not seen the same way that sports are in the rest of the world. While the rest of the world considers teams to be clubs, the term used more often than not in the US is that teams are franchises. Owners buy into the league and as such get a cut of league revenue, market sharing, and other things. While owners are certainly looking to see their team win games, it's also a business in many aspects for them as well. As mentioned above, owners have already paid into the single entity structure, they've made that investment in this current climate where they're not going to be relegated, they're certainly not going to vote for something that will force them to potentially lose a lot of money if they relegate to the second division and instead of playing New York and LA are playing in Tampa or Edmonton. Now that I've said that, let me say that promotion and relegation is a great concept when there are enough teams that there is a need for it. Currently there is no need for it, in the 3 professional leagues that play in the US, Canada, and the Caribbean, there are only 41 professional teams, while in England for example there are well over 100 professional teams. In England the market dictates that there needs to be promotion and relegation because of the number of teams there. With only 41 teams, and some of those struggling to even draw 100, let alone 1,000, there is not the market for promotion and relegation in the US. The other thing that fans of promotion and relegation like to throw out is that it creates drama for more teams and cuts down on the number of meaningless games. The problem with that is that MLS has a similar set up, only it's in a different place in the table. Instead of their being relegation battles, there are battles for the final playoff spots. For proof of this, check out this post from Climbing the Ladder, showing that since 2002 there have only been 19 games that have been "meaningless" for both teams playing in the game. The playoff battle creates a different type of excitement than a relegation battle does, but it certainly creates drama and excitement and cuts down on meaningless games. Each league has meaningless games as the season draws to a close. For example, there's not going to be a whole lot riding on the Fulham-Bolton game coming up soon as both teams look to be in a decent position at this point to survive in the EPL for another season. Two more blows were struck to "European" soccer fans in the same interview, as Abbott said that MLS would not be switching to a single table, which shouldn't surprise anyone as the league continues to expand. The league will also not be switching from their March-November schedule to the "international calender." I put that in quotes because there is no "international calender". Plenty of other leagues play in the summer months like MLS does. Most of those leagues, like many MLS cities have winters that would preclude them from hosting home games for many months at a time. It'd be pointless to move to a August-May/June schedule if it means creating a winter break longer than the offseason itself. Now I do believe that MLS does need to align itself with the true international calender, which means stopping league play on FIFA international windows so that teams are not punished for having national team players, like KC could be for this summer's Gold Cup. A day late as I got distracted watching the RSL-Monterrey game last night. So here is this week's update a day late. Akeem Priestley is back on the map as he's now playing with the Los Angeles Blues in the USL-Pro division. Also, Eddie Johnson looks like he could be on his way back to MLS. His contract with Fulham expires this summer so Johnson could find himself coming back to MLS via the allocation order. Also, Nick Garcia is going to be back playing, as he is going to play in the Kansas Magic exhibition in Topeka on April 30th. Here's the rest of this week's update. Jimmy Conrad - Chivas USA - Did not dress in Chivas' 0-0 draw with Vancouver. Adam Cristman - LA - Did not dress in LA's 2-1 win over Chicago. Luis Gil - Salt Lake - Did not dress in RSL's 2-2 draw with Monterrey. Taylor Graham - Seattle - Did not dress in Seattle's 1-1 draw with Philadelphia. Kevin Hartman - Dallas - Started and played 90 minutes in Dallas' 3-2 loss to Portland. Frankie Hejduk - LA - Started and played 79 minutes in LA's 2-1 win over Chicago. Will Hesmer - Columbus - Started and played 90 minutes, recording the shutout in Columbus' 1-0 win over KC. Jack Jewsbury - Portland - Started and played 90 minutes in Portland's 4-2 win over Chicago. Started and played 90 minutes, getting a goal and an assist in Portland's 3-2 win over Dallas. Jonathan Leathers - Vancouver - Started and played 90 minutes in Vancouver's 0-0 draw with Chivas. Rauwshan McKenzie - Salt Lake - Did not dress in RSL's 2-2 draw with Monterrey. Kurt Morsink - DC - Did not dress in DC's 3-0 win over Toronto. Ryan Pore - Portland - Dressed but did not play in Portland's 4-2 win over Chicago. Dressed but did not play in Portland's 3-2 win over Dallas. Scott Sealy - San Jose - Came off the bench and played 26 minutes in San Jose's 3-0 loss to New York. Khari Stephenson - San Jose - Started and played 62 minutes in San Jose's 3-0 loss to New York. Tyson Wahl - Seattle - Dressed but did not play in Seattle's 1-1 draw with Philadelphia. Josh Wolff - DC - Started and played 90 minutes in DC's 3-0 win over Toronto. Kevin Friedland - Minnesota - Did not play in Minnesota's 1-1 draw with Fort Lauderdale. Aaron Hohlbein - Fort Lauderdale - Started and played 90 minutes in Fort Lauderdale's 1-1 draw with Minnesota. Amir Lowery - Montreal - Started and played 85 minutes in Montreal's 2-1 loss to Carolina. Abe Thompson - Fort Lauderdale - Did not play in Fort Lauderdale's 1-1 draw with Minnesota. Stephen Armstrong - Charleston - Did not dress in Charleston's 2-1 win over Dayton. Edson Elcock - Richmond - Started and played 74 minutes in Richmond's 1-0 win over Rochester. Tom Gray - Pittsburgh - Did not have a game this week. Neal Kitson - Rochester - Started and played 90 minutes in Rochester's 1-0 loss to Richmond. Started and played 90 minutes in Rochester's 1-0 loss to Wilmington. Akeem Priestley - LA - Came off the bench and played 45 minutes, recording an assist in LA's 3-0 win over Sevilla FC Puerto Rico. Did not dress in LA's 2-1 win over Antigua Barracuda. Started and played 90 minutes getting a goal and an assist in LA's 4-2 win over Puerto Rico United. John Wilson - Charleston - Started and played 90 minutes in Charleston's 2-1 win over Dayton. Sunil Chhetri - Chirag United - India - Scored a goal in Chirag's 1-1 draw wtih Mohun Bagan. Pablo Escobar - Deportivo Cali - Colombia - Started and played 90 minutes in Cali's 2-1 loss to Atletico Nacional. started and played 90 minutes in Cali's 1-0 win over Deportes Quindio. Herculez Gomez - Pachuca - Mexico - Started and played 90 minutes in Pachuca's 2-1 loss to Atlas. Zoltan Hercegfalvi - Budapest Honvéd - Hungary - Did not dress in Honved's 1-0 loss to Papa. Will John - NK Vinogradar - Croatia - Started and played 65 minutes in Vinograder's 3-2 win over Suhopolje. Lost 1-0 to Gorica today. Eddie Johnson - Fulham/Preston - England - Started and played 72 minutes in Preston's 3-1 win over Sheffield United. Carlos Marinelli - Universidad San Martin - Peru - Started and played 90 minutes in San Martin's 2-0 loss to Sport Huancayo. Did not dress in San Martin's 2-0 loss to Once Caldas. Yura Movsisyan - FC Krasnodar - Russia - Did not dress in Krasnodar's 0-0 draw with Krylya Stovetov. Did not dress in Krasnondar's 2-1 loss to Spartak Moskva. Matt Taylor - Rot Weiss Ahlen - Germany - Started and played 90 minutes in Ahlen's 3-0 loss to Wehen Wiesbaden. Started and played 86 minutes, scoring a goal in Ahlen's 2-0 win over Jahn Regensburg. Tonight, Real Salt Lake begins it's attempt to become the first team since the 2000 LA Galaxy to win the CONCACAF Champions' League/Cup. A US team has made the finals for the first time since the format changed for the 2008-2009 season. The first even since LA's run to the finals in 2000, when the entire tournament was hosted in Los Angeles. Winning the home and home series against Monterrey would make Salt Lake the third US team to lift the title after the 2000 Galaxy and 1998 DC United team. Winning this series with Monterrey would put them in limited company when it comes to MLS teams winning a series against a Mexican side. In fact only once has an MLS side won a home and home series with a Mexican team. That was the 2002 Kansas City Wizards who won their quarterfinals series with Santos Laguna 3-2 on aggregate. KC qualified for the quarterfinals after defeating W. Connection of Trinidad 3-0 on aggregate, winning away 1-0 on a Francisco Gomez goal and 2-0 at home thanks to goals by Mike Burns and Preki. In the first leg down in Mexico, the Wizards lost 2-1 to Santos. Santos' two goals came from future Chivas USA player, Eduardo Lillingston. KC picked up a very important goal in the 81st minute, when Gary Glasgow scored off an assist from Gomez to make it 2-1. With the way that RSL has played at home the past two years, this would be a result that while they wouldn't be thrilled about, they'd take. No MLS team, as of yet, has won a game down in Mexico, Houston, DC, and Toronto have all gotten draws south of the border. In the group stages of this year's competition, it looked like RSL would be the ones to break it, but they suffered a heart breaking 5-4 loss to Cruz Azul. In the second leg back at Arrowhead, Kansas City pulled out a 2-0 win over Santos to book themselves a spot in the semifinals. A first half goal by Carey Talley evened the aggregate score (there was no away goal rule in the competition at this time as the 2005 cup showed for KC fans), and then in the 71st minute, Chris Brown scored the series winner off of an assist from Preki. KC moved on to the semifinals where they loss on aggregate 7-2 to Monarcas Morelia. But the Salt Lake series is much bigger than KC's was at the time and the MLS teams in the competition are certainly taking the competition more seriously now. Good luck to Salt Lake in their series, hopefully they can join KC as MLS sides that have won home and home series against Mexican teams. Here are your Sunday after stats. In the 34th minute, Roger Espinoza hit the 5,000 minute mark in all competitions. In the 11th minute, Michael Harrington moved past Jose Burciaga and into 13th place for the most minutes played in all competitions, he finished the game with 10,704 minutes played. In the 49th minute, Harrington moved past Burciaga and into 14th place on the list for most league minutes, he finished the game with 9,441 minutes played. Harrington's start was his 116th in all competitions, tying him with Uche Okafor for 14th place on that list. Harrington also made his 105th league start, breaking his tie with Sean Bowers for 15th place on that list. Sporting Kansas City get back to league play tomorrow when the Wizards will take on the Columbus Crew at Crew Stadium. After having last week off, KC has had a chance for a few of those nagging injuries to heal up. The Crew on the other hand were busy last week when they went out to LA and took on Chivas USA. The two teams played to a 0-0 draw in what was considered to be a very dull affair where neither side really impressed offensively. That seems to be the Crew's way in the early part of this season as they have only scored three goals this season. On the opposite end they have only allowed three goals as well. Chad Marshall appears to have overcome some concussion syndromes earlier this season and has helped lead the Columbus defense along with former Wizards goalkeeper, Will Hesmer. Kansas City suffered a blow last week when Omar Bravo had his sports hernia surgery flair up, and the Wizards DP will now miss 4-6 weeks recovering from the injury. And while KC's depth will be hurt, the starting attack should still be pretty potent as Teal Bunbury, Kei Kamara, and CJ Sapong showed in Vancouver. Can they do it again against a tougher defensive opponent? We will see soon enough. With Aurelien Collin, the question becomes who is going to start next to Matt Besler tomorrow, is it going to be Juilo Cesar again, who has failed to impress me in his two outings, or Shavar Thomas? Other than that I think we're likely to see the same lineup that we saw two weeks ago in Vancouver against the Whitecaps. Number to Remember - 3 - As I said earlier, it's the number of goals that Columbus has scored and allowed this year. It's also a number that at least 1 team has scored in all three of Sporting KC's games. Key Match Up - Birahim Diop vs Eddie Gaven - Diop seems the likely candidate to start at the defensive midfield position for the second straight game. And while Arnaud has had plenty of defensive responsibilities in the past few games, shutting down Gaven is a key to shutting Columbus down. PREDICTION - This is one of those key match ups when a good offensive team takes on a good defensive team. Which side will be able to take advantage of the other will be the key. Can KC continue their hot offense or will Columbus' defense step up and be the first to really shut down KC? Columbus has been a tough team to break down, but if any team can break down it'll be KC with the 3 pronged attack of Kamara, Bunbury, and Sapong. I think tomorrow will be close but I think the extra time off will be to the benefit of KC. Today is transfer deadline day for MLS' "primary" window, and as expected, Sporting Kansas City made a move. It may not have been the exciting, potentially surprising move that some people thought, but it was a long expected move and definitely fills a big need on the team. Today Kansas City officially signed Aurelien Collin to help shore up the back line. Collin will likely be competing for a starting job once his ITC card is clear. The way things have looked in the first three games I'm hoping for a partnership with Matt Besler in the center of defense. Collin had been one of three defensive targets that KC was looking at along with Aaron Galindo and long time trialist Omar Colley. All three had some sort of road block in the way of signing. Galindo was in the middle of a law suit with his former club Chivas Guadalajara. Colley's old club in Gambia wanted some compensation for him signing with KC. Collin was in a dispute with his former club in Portugal as well that almost kept a deal from happening. Well this rumor has lasted longer than the Diego Chara rumor did earlier this week. Earlier today Charles Gooch tweeted about Peter Vermes being excited about a possible transfer deadline deals. He also mentioned the the name Cristian Nazarit. Nazarit, or Nazarith as his wikipedia page spells it, currently plays for Independiente Santa Fe in Colombia. Gooch isn't the first to link him with a move to KC, as this article shows. Nazarit seems to have a decent scoring touch based on his recent record with Santa Fe and the Colombian youth teams. Back in December he was apparently being watched by both Chelsea and Real Madrid. Certainly not the defensive help that I think most Sporting KC fans think KC needs with the window about to close. But it'd likely make KC the deepest offensive team in the league with Nazarit competing for time with Teal Bunbury, Omar Bravo, Kei Kamara, CJ Sapong, and Ryan Smith. UPDATE: And I think Robb just waits until after I post to squash these rumors as he's done it again tonight. Nazarit doesn't look to be on his way either. The American game is in full swing now for all but the PDL here in the US, so plenty more former Wizards are playing now. Here's the rest of this week's former Wizards update. Jimmy Conrad - Chivas USA - Did not dress in Chivas' 0-0 draw with Columbus. Adam Cristman - LA - Did not dress in LA's 1-1 draw with DC. Did not dress in LA's 0-0 draw with Toronto. Luis Gil - Salt Lake - Came off the bench and played 11 minutes in RSL's 2-0 win over New England. Did not dress in RSL's game vs Colorado. Taylor Graham - Seattle - Did not dress in Seattle's 2-1 win over Chicago. Kevin Hartman - Dallas - Started and played 90 minutes, getting the shutout in Dallas' 3-0 win over Colorado. Frankie Hejduk - LA - Dressed but did not play in LA's 1-1 draw with DC. Dressed but did not play in LA's 0-0 draw with Toronto. Will Hesmer - Columbus - Started and played 90 minutes, recording the shutout in Columbus' 0-0 draw with Chivas. Jack Jewsbury - Portland - Did not have a game this week. Jonathan Leathers - Vancouver - Started and played 90 minutes in Vancouver's 3-1 loss to Houston. Rauwshan McKenzie - Salt Lake - Started and played 90 minutes in RSL's 2-0 win over New England. Did not dress in RSL's game vs Colorado. Kurt Morsink - DC - Did not dress in DC's 1-1 draw with LA. Khari Stephenson - San Jose - Started and played 80 minutes for San Jose's 1-1 draw with Toronto. Tyson Wahl - Seattle - Did not dress in Seattle's 2-1 win over Chicago. Josh Wolff - DC - Started and played 90 minutes in DC's 1-1 draw with LA. Kevin Friedland - Minnesota - Did not play in Minnesota's 2-1 win over Atlanta. Aaron Hohlbein - Fort Lauderdale - Started and played 90 minutes in Fort Lauderdale's 2-1 loss to Edmonton. Amir Lowery - Montreal - Started and played 90 minutes in Montreal's 1-0 loss to Tampa. Abe Thompson - Fort Lauderdale - Did not play in Fort Lauderdale's 2-1 loss to Edmonton. Stephen Armstrong - Charleston - Started and played 72 minutes in Charleston's 1-0 win over Charlotte. Edson Elcock - Richmond - Started and played 90 minutes in Richmond's 2-1 win over Pittsburgh. Tom Gray - Pittsburgh - Started and played 90 minutes in Pittsburgh's 2-1 loss to Richmond. Neal Kitson - Rochester - No game this week. Yomby William - Richmond - Started and played 90 minutes, recording an assist in Richmond's 2-1 win over Pittsburgh. John Wilson - Charleston - Started and played 90 minutes in Charleston's 1-0 win over Charlotte. Sunil Chhetri - Chirag United - India - Scored a goal in Chirag's 2-1 loss to Churchill Brothers. Eloy Colombano - Ferrocarril Sud - Argentina - Started and played 74 minutes in Ferro's 1-0 win over Grupo Universitario. Pablo Escobar - Deportivo Cali - Colombia - Did not play in Cali's 2-1 win over Deportivo Pereira. Herculez Gomez - Pachuca - Mexico - Came off the bench and played 27 minutes, scoring two goals in Pachuca's 3-0 win over Jaguares. Came off the bench and played 24 minutes, scoring a goal, in Pachuca's 4-2 loss to UANL. Zoltan Hercegfalvi - Budapest Honvéd - Hungary - Did not dress in Honved's 3-1 win over Szombathelyi Haladas. Will John - NK Vinogradar - Croatia - Played in Vinogradar's 1-1 draw wtih Rudes. Eddie Johnson - Fulham/Preston - England - Started and played 76 minutes, recording an assist in Preston's 1-1 draw with Portsmouth. Started and played 78 minutes in Preston's 1-1 draw with Doncaster. Carlos Marinelli - Universidad San Martin - Peru - Did not have a game this week. Yura Movsisyan - FC Krasnodar - Russia - Did not play in Krasnodar's 1-0 win over Amkar Perm. Matt Taylor - Rot Weiss Ahlen - Germany - Started and played 76 minutes in Weiss' 2-0 win over Bayern nMunchen II. Posted a little bit ago on Twitter was this comment from Raza Deportiva. For those that don't read Spanish, or don't want to pull up a translator, it basically says that Sporting KC is going to pay a $2 million transfer fee for Colombian holding midielder, Diego Chara. I've been unable to find anything other than that Tweet that links him with the SKC Wizards, but I did find this article that says that Chara has been sold to MLS for $2 million. Chara is a 24 year old holding midfielder currently playing for Deportes Tolima in the Colombian first division. According to his Wikipedia page, Chara also has one cap for the Colombian national team as well. An interesting development for KC. Is this the player that Robb Heineman mentioned via twitter? The defense has been shaky this season, and could use some shoring up, but I still think central defense is the big need. We haven't gotten word on Aurelien Collin or Aaron Galindo and the transfer window for MLS is almost closed. The interesting thing will be what this means for the team's current d-mids, like Craig Rocastle, Stephane Auvray, and even Birahim Diop. UPDATE: Robb Heineman has killed this rumor pretty quickly, posting on Twitter tonight that he's never heard of the guy before. Today US Soccer announced the roster for the US U-18 game that will take place at the Nike Campus in Portland. Jon Kempin, KC's third goalkeeper and first academy signing has been named as one of two goalkeepers to the roster for the camp. The camp takes place April 16th through the 24th. During that time the US team will play games against the Portland Timbers, the University of Portland, and the University of Washington. Also congrats to three local girls who have been called up the US women's U-20 camp in Californina at the Home Depot Center. Kaysie Clark and Shea Groom from Liberty, and Mandy Laddish of Notre Dame via Lee's Summit. The camp for the women goes from April 23rd through the 30th. The Swope Park Rangers opened the 2011 reserve league season today down in Houston when they took on the Dynamo. The team has said this season that they like the depth that they have with this team, but all the injuries have piled up, as Sporting KC had to start two Juniors players (Nate Opperman and Wes White both from the U16s) up top due to injuries that have forced some reserves into starting roles. Scott Lorenz had the Rangers' best chance in the first half when he hit the post after getting in behind the Dynamo's defense. The only goal of the game came in the second half as Dynamo Francisco Navas Cobos played a free kick into the box that was headed in by Jason Garey. MISL MVP, Byron Alvarez was a second half substitute for the Rangers. Also coming on as a substitute, was trialist Gualberto Mojica. The 26 year old Mojica is a Bolivian playmaker currently on the roster of Club Blooming in Bolivia and has appeared 15 times for the Bolivian national team during his career. Certainly a rough start to the season for the Rangers, but as players get healthy the reserve team will improve as well. And as a whole the purpose of the reserve league is to get these guys game time so that they can develop into contributors for the first team in the future. The Rangers' next game is on May 3rd at Swope Park against Real Salt Lake. In news that has kind of gone a bit unnoticed today, Thad over at The Back Post has news on Teal Bunbury's one time FIFA switch from Canada to the United States. According to Thad, the switch was approved last week by FIFA and Bunbury is officially set to play for the United States. What this means is that Bunbury is now able to play for the US national team in competitive games like World Cup qualifiers and confederation competitions like this summer's Gold Cup. Which if Bunbury can retain his form seems like a good bet to make the roster. Throughout their history, Sporting Kansas City Wiz/Wizards have never had a traditionally hated rival. In the first two years of the league it looked like Dallas could become that rival with some rough games and the 1996 playoffs, but with the addition of Chicago in 1998 and the Brimstone Cup, and then the addition of Houston, we've fallen well down the list in terms of rival for Dallas. Colorado seemed like a decent candidate, but nothing ever really developed, and then KC moved East as Salt Lake came into the league and the Rocky Mountain Cup was born. Chicago has always seemed like the perfect rival for KC, Chicago is one of the closest road trips for KC (about the same as Colorado and Dallas give or take a little bit), there are games for trophies involved (MLS Cup 2000 and US Open Cup 2004), there are even those rivalry games that can be used to dig at the other team (July 4, 2001, 7-0 Chicago). But the rivalry has never really developed, mainly because Chicago has more or less turned their noses up at KC for a number of reasons. First Chicago's nickname is the second city, they see themselves as a rival with the big cities, no use wasting their time with a "small market" like KC. The other thing has been KC's attendance history both for the whole stadium and for the supporter's section. Section 8 in Chicago has been one of the league's best supporter groups for years. On the other hand the Mystics/Cauldron/Members section has had a very slow growth to the section until the past few years when it exploded. When I joined the section back in 2004 I never imagined we'd get a traveling crowd of 300 to go on any road trip. The final thing that's been a deterrent to a rivalry has been KC's pitiful record in Chicago, 2 wins in their entire history in the Windy City is not the way to develop a rivalry. OnGoal and Sporting KC's front office seem set on trying to change that mindset. First was the announcement before the road trip was set up that the team had purchased 300 tickets for away fans for the Fire home opener. The "Sporting 300" did travel and with the loss I think it was a distinct message to Chicago on their intent. Then the same weekend of the game Robb Heineman tweeted that the team would be donating $500.00 for every goal scored on the Fire this season. He clarified this point saying every goal ANY team scores against Chicago this season. Then today comes the announcement that any time the Fire lose this season you can get a free medium sub when you buy chips and a drink and tell the cashier "Put out the fire". This is only available at KC area locations. I get the promotion, it's cute with the tie in with firefighters and all. I like that we're seeing more marketing out there, but part of me feels like this is a cry for attention type thing from KC. They're trying to force a rivalry without the other side really responding. The closest KC fans have gotten to a rivalry type response was for those of us on the bus to/from Chicago that got copies of the 7-0 July 4th game with the 2000 MLS Cup logo on the front. In the end that was that great considering by the time people got onto the bus the next morning word had already made the rounds of what was on the DVD and only 1 person really watched it. Quite a bit of money put out for something that had little to no response. This just seems to feel like the little kid (Sporting KC) trying to force there way to the big kids table any way they can. I'm not quite sure I know how to feel about this. On one hand I think this is kind of a cool promotion an interesting way to try to develop a rivalry, by giving KC fans benefits for losses by Chicago. There aren't many other sports teams that do this type of thing. On the other hand that is also the part that bugs me about this. Most teams will do promotions that prompt their own team (like the Planet Sub Hattrick special the past two years). Part of me wonders why the team isn't able to sell the success of the team instead of the demise of an opponent who has at best shown apathy and at worst dis-interest in Sporting KC. In the end I'd rather have promotions like the Firehouse sub deal applied to KC wins instead of other teams losses. This just comes off as weak and just a attempt to be cute in their marketing. Let rivalries develop naturally. For example that preseason "brawl" with RSL, that's certainly going to create some animosity on the field in both games this season. Those are the type of things that can start to develop rivalries. Not some promotions based off of when the other team loses to someone other than KC. Wizards forward and designated player Omar Bravo is set to miss three to six weeks with a sports hernia injury. Bravo aggravated the injury on Wednesday night in the team's US Open Cup qualifying game against the Houston Dynamo. The good news is that with KC off this weekend the number of games he misses is down. If he misses the full six weeks Bravo would miss games in Columbus, New England, New York, and LA. This is thanks to another break the weekend of May 7th that would limit his time. Hopefully he misses on the lower side, but the good news is that CJ Sapong has proven himself to be more than capable of playing at this level. With Teal Bunbury and Kei Kamara the team's starting front line should be fine. Ryan Smith is also nearing his return as well which will help as well. Not a lot of stats from the game against the Dynamo, but here are a few. Michael Harrington is on the KC player to appear in all four US Open Cup qualifiers KC has ever played. The shutout was Eric Kronberg's second career shutout, he earned one in KC's 0-0 draw with the USL Seattle Sounders in the 2008 US Open Cup that the Wizards lost on penalties. With the weekend off, KC threw out a virtual first team lineup in their game against the Houston Dynamo, with Eric Kronberg and Shavar Thomas being the only two players that hadn't started a game yet this season for KC. The Dynamo put out a few first teamers, but also put out more reserves than KC did. It took overtime, but KC pulled out a 1-0 win over the Dynamo thanks to a 92nd minute goal by CJ Sapong. Unfortunately I was never able to get the stream from either Houston or KC's website to work so I listened to the entire game on Sports Radio 790 out of Houston. By the sounds of it, both teams had some good chances in regulation with Kronberg coming up big, especially late for KC, and Tyler Deric coming up big for the Dynamo. Kronberg may have had the biggest late in the second half on Will Bruin to preserve the tie and send it to extra time. It's great to see the defense hold out and keep a shutout after allowing 8 in their first 3 league games. Hopefully this is the start of a turn around for the defense after the trouble starting the season. The defense needed to prove something this tonight after the performance against Vancouver and they did it tonight with a strong defensive performance, as Matt Besler said, "that's how it's done." With a week and a half off now until the next game hopefully all the knocks and bruises will be able to get up to prepare for the game against Columbus. KC now gets the chance to host the 3rd qualifying round. A great opportunity to see the team at home before the home opener against Chicago in June. KC will be hosting either New England or DC after they defeated Philadelphia on penalty kicks tonight in their first round qualifying match. The location of the game in KC has not been decided yet, but as Robb Heineman posted on Twitter, it's either going to be at UMKC or at the Blue Valley Athletic Complex. UMKC hosted last year's qualifier against Colorado, the first time KC had played on UMKC's campus. Blue Valley has hosted the majority of open cup qualifiers played in KC. UMKC is turf while Blue Valley is a grass surface. Pros and cons of both personally I felt the atmosphere at UMKC last year was great and wouldn't mind returning there this year. Wizards Man of the Match - Eric Kronberg - Again I'm only able to go off of what I heard while listening to the broadcast, but it certainly sounded like Kronberg kept us in this game at times. Another week of former SKC Wizards update. There's been no big news this week outside of the games so we'll just get right to the updates. Jimmy Conrad - Chivas USA - Did not play in Chivas 0-0 draw with Toronto. Adam Cristman - LA - Did not dress in LA's 1-0 win over Philadelphia. Luis Gil - Salt Lake - Did not dress in RSL's 2-1 loss to Saprissa in the CCL. Taylor Graham - Seattle - Did not dress in Seattle's 2-2 draw with San Jose. Kevin Hartman - Dallas - Started and played 90 minutes in Dallas' 2-0 loss to Columbus. Frankie Hejduk - LA - Dressed but did not play in LA's 1-0 win over Philadelphia. Will Hesmer - Columbus - Started and played 90 minutes, recording the shutout in Columbus' 2-0 win over Dallas. Jack Jewsbury - Portland - Started and played 90 minutes, scoring a goal in Portland's 1-1 draw with New England. Jonathan Leathers - Vancouver - Started and played 90 minutes in Vancouver's 3-3 draw with KC. Play New England tonight in league play. Rauwshan McKenzie - Salt Lake - Did not dress in RSL's 2-1 loss to Saprissa in the CCL. Kurt Morsink - DC - Started and played 82 minutes in DC's 4-1 loss to Colorado. Dressed but did not play in DC's 2-2, 4-2 PK shootout win over Philadelphia in the US Open Cup. Ryan Pore - Portland - Dressed but did not play in Portland's 1-1 draw with New England. Scott Sealy - San Jose - Came off the bench and played 5 minutes in San Jose's 2-2 draw with Seattle. Khari Stephenson - San Jose - Came off the bench and played 45 minutes, scoring a goal in San Jose's 2-2 draw with Seattle. Tyson Wahl - Seattle - Did nont dress in Seattle's 2-2 draw with San Jose. Josh Wolff - DC - Came off the bench and played 25 minutes in DC's 4-1 loss to Colorado. Started and played 45 minutes, scoring a goal in DC's 2-2, 4-2 PK shootout win over Philadelphia in the US Open Cup. Kevin Friedland - Minnesota - Season has not started yet. Aaron Hohlbein - Fort Lauderdale - Season has not started yet. Amir Lowery - Montreal - Season has not started yet. Abe Thompson - Fort Lauderdale - Season has not started yet. Stephen Armstrong - Charleston - Season has not started yet. Edson Elcock - Richmond - Started and played 89 minutes in Richmond's 2-0 win over Orlando. Tom Gray - Pittsburgh - Season has not started yet. Neal Kitson - Rochester - Season has not started yet. Yomby William - Richmond - STarted and played 90 minutes in Richmond's 2-0 win over Olrando. John Wilson - Charleston - Season has not started yet. Jamar Beasley - Missouri Comets - Season is over. Chris Brunt - Omaha Vipers - Season is over. Boris Pardo - Missouri Comets - Season is over. Nelson Pizarro - San Diego Sockers - Season is over. Paul Wright - San Diego Sockers - Season is over. Sunil Chhetri - Chirag United - India - Started and played 90 minutes, scoring a goal in Chirag's 4-2 loss to Dempo. Eloy Colombano - Ferrocarril Sud - Argentina - Started and played 90 minutes in Ferro's 0-0 draw with Liniers. Pablo Escobar - Deportivo Cali - Colombia - Started and played 90 minutes in Cali's 3-2 win over America de Cali. Herculez Gomez - Pachuca - Mexico - Dressed but did not play in Pachuca's 3-1 win over Morelia. Zoltan Hercegfalvi - Budapest Honvéd - Hungary - Did not dress in Honved's 3-1 loss to Zalaegerszegi. Will John - NK Vinogradar - Croatia - Defeated Imotski 2-1. Eddie Johnson - Fulham/Preston - England - Started and played 59 minutes in Preston's 2-1 win over Swansea. Started and played 83 minutes in Preston's 2-1 loss to Reading. Carlos Marinelli - Universidad San Martin - Peru - Started and played 90 minnutes in San Martin's 0-0 draw with Leon de Huanuco. Yura Movsisyan - FC Krasnodar - Russia - Did not dress in Krasnodar's 1-1 draw with CSKA Moscow. Matt Taylor - Rot Weiss Ahlen - Germany - Started and played 76 minutes in Weiss' 2-0 loss to Saarbrucken. Started and played 90 minutes in Weiss' 5-0 loss to Sandhausen. I posted on Twitter today, but here's a full post for you on the new From the Byline to the Back Post. Fast forward to segment two if you want to check out mine and Thad's preview for tonight's game against Houston, then rewind to here us talk about the Vancouver game. We also discuss some player news as well. Available on iTunes and Posterous. Thanks again to the Vandon Arms for the music. Tomorrow Kansas City starts their attempt to qualify for the Open Cup proper when they take on the Houston Dynamo in College Station in a qualification match for both MLS sides. The good news in one regard for KC is that while Houston plays this coming weekend, Kansas City does not. Meaning that they have a little extra time for rest after the game and that could potentially see KC put out a stronger lineup than the Dynamo who have Vancouver coming to town on Sunday. The Dynamo have draw each of their past 2 matches thanks in large part due to the goalkeeping of Tally Hall. While Houston was out played in both games they rode hot goalkeeping to earn a point in each of those games. The question is if Hall or Tyler Deric get the start tomorrow for the Dynamo. As for KC, it appears that plenty of first team players are traveling to Houston for the game. Tweets from Davy Arnaud and Kei Kamara have put them down in Houston. Also Eric Kronberg and Jon Kempin have apparently traveled as well. Which would seem to point to Kronberg getting the start and Jimmy Nielsen staying at home. I would think that Omar Bravo gets a start as well so that he's not 3 weeks without a competitive game for KC. It would appear that Chance Myers, Graham Zusi, Ryan Smith, and Julio Cesar all didn't travel. I think we'll see a bit of a mix but quite a few first teamers on the field for KC tomorrow. Number to Remember - 0 - The number of wins that KC has in Open Cup qualifying matches. They lost to RSL in 2007, tied Colorado in 2008 (won on penalties), and lost to Colorado in 2010. To qualify for the open cup this year they'll need to win, or draw and advance on PKs twice. Key Match Up - N/A - I don't have a enough of an idea on what lineup Houston is going to put out tomorrow to come up with a key match up for tomorrow's game. PREDICTION - I think KC will put out the stronger lineup tomorrow just because of their open schedule this weekend. That should make KC the favorites going into the game. The team will also have a bit of a chip on their shoulder trying to get the bad taste from Vancouver out of their mouths. The question will be can the defense step up and actually shut a team down offensively? I'm not sure they'll be able to completely, but I think KC has the better offense and will be able to hold out this time. In the past day or so there's been some interesting news on some potential players for KC that has come out. The biggest bit of news came from Robb Heineman last night on Twitter where he stated that the team had come to a verbal agreement with a defender/defensive midfielder. Certainly a good sign after the performance late in the game in Vancouver. And is that player Aaron Galindo? That's the belief of Andy over at The Daily Wiz. Galindo has most recently played with Chivas Guadalajara in 2009 through 2010 after spending time with Eintracht Frankfurt and Grasshoppers. He began his career with Cruz Azul. Back in 2005 Galindo was suspended for testing positive for performance enhancers. He hasn't played a competitive game in about a year, and has recently been trying to settle a lawsuit with Chivas. Certainly an interesting pick up and will be interesting to see what comes out of this. In other news, Andrew Wiebe has some more news on potential players in today's notebook. First, as Thad and I talk about on this week's podcast, Michal Mravec is gone from the team, looks like just the number of internationals already with the team. The UAB midfielder had made it all the way through preseason but couldn't find a spot on the team's roster due probably in large part due to his international status. The other news is on a trialist that's been in camp for a while, Omar Colley. The team appears very interested in signing the Gambian, but even though he's out of contract his former club is wanting some compensation by the Wizards that the team currently looks unwilling to pay. It will be interesting to see if they can reach some kind of agreement. Finally on Aurelien Collin looks to be in a similar boat as Colley where he current club is wanting some compensation. He is basically going to arbitrators to try and get out of his current contract. If he can he could be here soon. Hopefully the team can get it done soon. Here are some stats from yesterday's 3-3 draw with Vancouver. Kei Kamara's goal was his 12 league goal for KC, moving him past Francisco Gomez and Paul Wright and into a tie with Igor Simutenkov, Miklos Molnar, and Chris Henderson for 17th on that list. Davy Arnaud made his 250th appearance in all competitions for KC. It was also Arnaud's 200th league start for KC. Arnaud broke his tie with Preki for 4th place on the list for most league starts with that 200th appearance. Michael Harrington made his 131st appearance in all competitions for KC, breaking his tie with Jose Burciaga and Uche Okafor for 15th place on that list. It was also Harrington's 116th league appearance breaking his tie with Burciaga for 15th place on that list too. Harrington also made his 114th start in all competitions, breaking his tie with Sean Bowers for 15th place on that list. Harrington also made his 104th league start, tying him with Bowers for 15th place on that list too. I thought given 12-14 hours after the game I would have calmed down about the result of the game, but I'm still frustrated with the result. Sporting KC pissed away two points yesterday, surrendering a 3 goal lead in the final 20 minutes, 2 in second half stoppage time to go from a 3-0 lead to a 3-3 draw. Games like this are games that a team has to shut the door on. Maybe as a Wizards fan I've become a little spoiled from the Bunker Bob days when you knew that KC would lock the game down especially with a 3-0 lead. But KC wasn't able to do that, and now I'm going to continue to be called Mr. Negative by Robb Heineman just like I was on Friday at the First Friday tailgate at the team's front office. Sorry Robb but you're going to get more negative today as that draw felt like a loss. Vancouver came out as the more impressive side early on and for much of the first half, but KC had one of the best chances early on as Davy Arnaud ripped a shot from about 25 yards out that Jay Nolly had to tip over the bar for a corner. Jimmy Nielsen though was the star of the half, called on to save the day multiple times for KC. And in the first half he was more than up to the task as Vancouver continually found space in front of KC's defense to get shots off. The Whitecaps forward line of Atiba Harris and Camilo caused plenty of trouble for KC's defensive line and forced Nielsen into many saves along with the rest of the Whitecaps team. Way too often yesterday Julio Cesar got turned around or gave too much space to Camilo and only good saves by Nielsen kept Vancouver off the board. Even with Vancouver controlling play, KC still got their chances. The best came from Teal Bunbury, who just before stoppage curled a nice shot just wide of the post. Only a minute or so later on the opposite side of the field Bunbury had the same opportunity and this time he curled it into the side netting giving KC a half time lead. In the second half KC stepped up their game from the start and about 10 minutes in KC has doubled their lead. Milso Stojcev played a nice ball through to Bunbury. Bunbury raced onto the pass, cut back on his defender and then fired past Nolly to give KC a 2-0 lead. Only four minutes after Bunbury's goal KC found themselves up 3-0. CJ Sapong raced down the left wing and fired in a cross on the ground. Kei Kamara ran onto it and fired it into the far post with a hard, low shot. The lead at this point looked insurmountable for the Whitecaps and the Wizards looked on their way to a big away game early in the season. Unfortunately things didn't hold up. The Whitecaps made some good substitutions and Sporting KC's defense finally gave in. A great run by substitute Nizar Khalfan down the right led to the first goal in the 73rd minute. The run started in Vancouver's own half on a give and go, Michael Harrington was unable to keep up with Khalfan and his cross into the middle was turned into the goal by Harris to get Vancouver back into the game. Things seemed to really go down hill for KC play wise once Davy Arnaud subbed out in the 76th minute. KC's midfield won very little in the midfield once Arnaud subbed out. Stephane Auvray was unable to help KC cut down on Vancouver's midfield control. By the end of the game, KC had 3 d-mids on the field as Craig Rocastle came in for Stojcev, but KC still could not get control of the midfield. KC withstood most of the pressure for the rest of the game though, including the introduction of Davide Chiumiento, who didn't start due to injury. But in stoppage time things fell apart and fell apart quickly for KC. Some how Chiumiento got left wide open by Roger Espinoza and Sapong on the left side for KC. Chiumiento had plenty of space to look up and pick out Camilo who fired the ball past Nielsen to make it 3-2. A minute later and Vancouver was level. Khalfan played a great cross into the box to Camilo who jumped while Espinoza looked to have cement on his legs and headed the ball past Nielsen to tie the game. And even after that play, KC almost improbably lost the game as Khalfan had a late chance that he fired just wide of Nielsen's post. Basic defensive errors and an inability to close down a game, it was a calamity of errors for KC in stoppage time, poor marking, poor defending, just a poor effort overall. Peter Vermes needs to get this defense worked out and get it worked out quickly because the road trip only gets tougher from here on out. KC showed extremely well going forward, but the defense is in shambles right now. Harrington looks like he hasn't played a competitive games in a few weeks (which he hasn't), Espinoza's form early on has been poor, Matt Besler has had to try and hold together a makeshift defense at times, and Julio Cesar gave his man way too much space and time too often yesterday. Unless Aurelien Collin is a superman the defense is going to leak goals all season. Wizards Man of the Match - Jimmy Nielsen - You don't see a goalkeeper win man of the match often when they give up three goals, but Nielsen absolutely deserves it for his performance yesterday. Nielsen stood on his head at times making some great saves, his defense just let him down too often, and you could tell just how upset he was with the defensive play. Player Ratings - Nielsen 7, Harrington 3, Besler 3, Julio Cesar 3, Espinoza 3, Stojcev 5, Arnaud 5, Diop 5, Kamara 6, Bunbury 7, Sapong 5. Subs Auvray 3, Thomas 3, Rocaslte NR.